Just so no one can accuse me of ignoring current album artistry — yes, that sounds a bit paranoid to me, too — I’ll point to this. A group, Panoram, I know next to nothing about, outside of its obvious electro/technic music association. I’ve little to say about the group’s music, having only sampled a few bytes of it online, but that cover remains a stunner. Everything I usually admire of photographic art — elegant imagery, high contrast, and a distinct grain within the medium — is clearly represented. 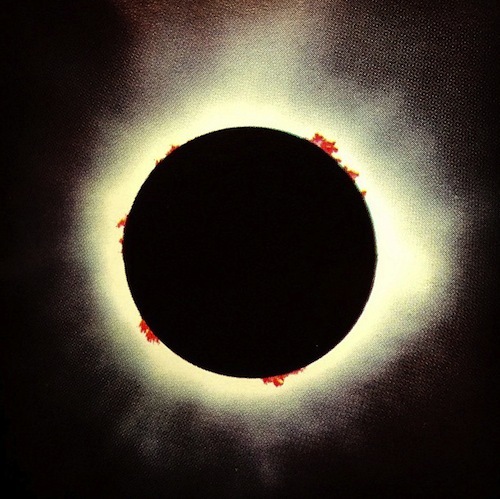 An impressive image of a solar eclipse by the album’s artists. No coincidence that today is the first eclipse of the 2014, be it a lunar one. We only have to wait till the 29th of this month for the annular solar variety. Still, this one captured the Sun’s corona as well some well-defined and red highlighted prominences spectacularly for its album art. Wish I could find who shot the image or how it was processed, but the silkscreened artwork worked quite well as an eye-catcher. I don’t know, given its music genre and small independent label, one specialising in oddball house, techno and electronics out of Edinburgh, UK, release, if or when this album cover might ever make a splash. Pop or otherwise. But its cover certainly did with me. I had a sneaking suspicion I’d seen similar before. The one on the left being the 1990 reissue of the ’74 recording by Andre Previn. 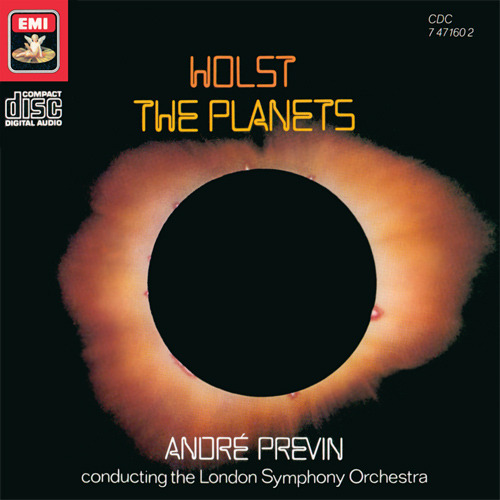 Holst’s The Planets. Previous releases depicted planets of the solar system as album art, but here an eclipse stood instead. Nice post, Michael. Love the cover but have not listened to the album. Thank you very kindly, Cindy. BTW, another Best Album Cover arrives this week, to. Good. I enjoy reading them.